SHANGHAI - Chinese social media users have seized on a viral meme in which people are pictured literally rolling in their own wealth, spawning a range of cheeky counter-posts poking fun at the country's nouveau riche. Posts related to the aptly-named Wealth-Flaunting Challenge on China's popular Weibo platform had been viewed more than 2.3 billion times, drawing more than a million comments. In the meme, which originated in Russia, social media users post pictures of themselves falling face-down to the pavement as they exit their cars, the ground strewn with their cash, credit cards, jewellery, designer bags and shoes, and other luxury items and electronics. Decades of skyrocketing economic growth have given China the most dollar billionaires of any country in the world with 620, according to Shanghai-based magazine publisher Hurun Report, and many of China's newly wealthy are not shy about showing off their luxury cars and accoutrements. But the meme has inspired a wealth of parodies in China, with people seeing it as a golden opportunity to mock the rich. In one, a man labelled as a "hard-working" staff member is shown on the ground in front of what appears to be an office building surrounded by an array of cleaning supplies, brooms and mops. Even government agencies have joined the party, providing a propaganda bonanza. Shanghai's fire department showed personnel splayed on the ground next to fire trucks and surrounded by firefighting equipment, while the Hubei province police department depicted a gun-toting officer standing next to his vehicle over four men on the ground in civilian clothes, representing "evil forces". And companies have seized on the frenzy to advertise their goods. 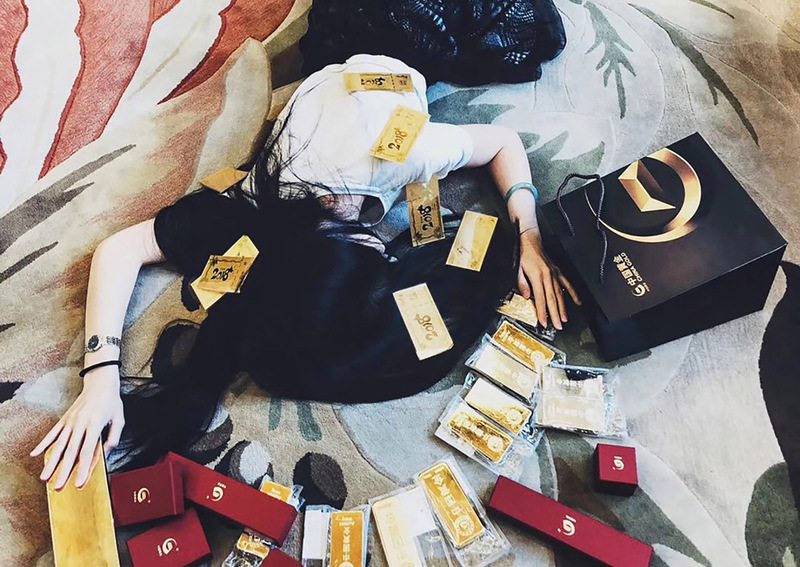 A woman who works for a subsidiary of China National Gold Group posed belly down with her feet up on a luxurious armchair and bullions strewn around her. Other tongue-in-cheek posts include a woman surrounded by an array of lipsticks with her feet resting on a white sofa, or a man on the ground with six cats. "Everyone has something he or she thinks is the most valuable or what he or she cares about the most. 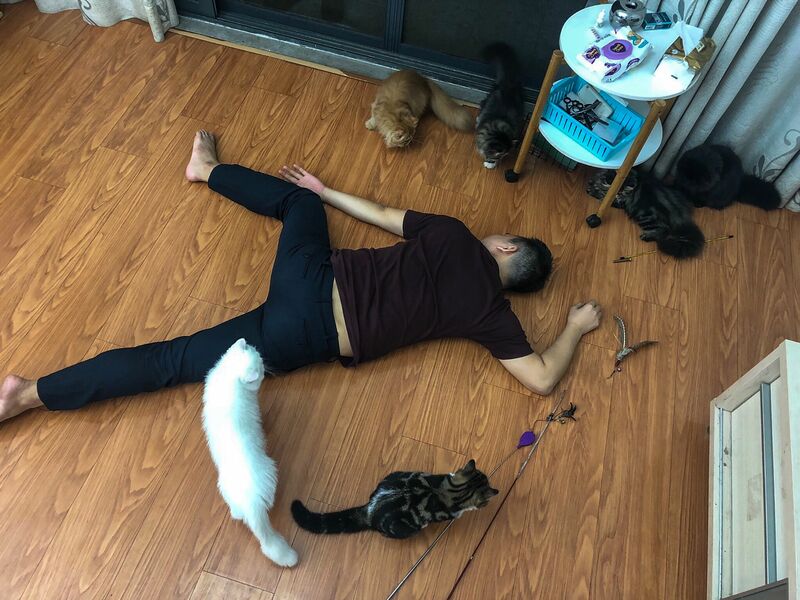 To me, it's my cats," said Mr Li Dong, 33, the cat owner who joined the challenge on Weibo in mid-October. "It's an exaggerated way of expression. I think it's fun so I showed my cats off," Mr Li told AFP. Much of the online reaction to the wave of postings dismissed them as a waste of time compared to the altruistic objectives of the previous "Ice Bucket Challenge", which went global. "Are these people out of their mind? How empty must their life be so that they are figuring out different ways to prove their existence," said one posting on Weibo. Others, however, were more positive about posts by university students and young workers using the meme to present academic and professional accomplishments. "It's disheartening to see young people being impacted by the pursuit of money and power. I support young people who are hard-working. That's where the country's hope lies!" read one post on Weibo. The first "falling stars challenge" was posted on Instagram by Russian DJ and music producer Andrey Shirman, known as DJ Smash, on July 30, showing him in tracksuit bottoms and a T-shirt sprawled face down at the foot of the gangway of a private jet. It was quickly followed by similar posts from a succession of high-profile models and socialites - most wearing swimwear or short shorts - photographed stretched out near private jets and luxury yachts. Their posts garnered tens of thousands of likes. One famous contributor was Ksenia Sobchak, former TV star and 2018 presidential candidate, who in mid-August put up a photo of herself in a swimsuit falling down the stairs of what appears to be a yacht. Criticism of this public flaunting of wealth has been muted in Russia, with commentators suggesting the whole fad was just a bit of summer fun. Like in China, as the #fallingstars2018 hashtag gained momentum, Russians started putting up parodies. One shows a young woman falling off a deckchair in a bikini; in another, a man is face down in front of a couch with his head on a fashion magazine. Every Barbie has her day.....just not TODAY! Karl and Coco enjoying my flat out on 33 degree celcius day, sizzling 🔥🔥🔥 hot stone moment.😝 Passing on this #fallingstarschallenge to @smalllaude @michaelcostefr @diyen168 @arthurkinggggg @melbatoast28 @b8k3unavatar can’t wait to see all your creativity. It’s almost the weekend, let’s have some fun guys!